When I left Blue Point Brewing's Seafood & Suds event a few days ago, you know I had a few goodies with me, right? Although their Wet Hop Pilz was on the tasting list that evening, I wanted to check out this bomber bottle by itself without seafood or other competing beer flavors. 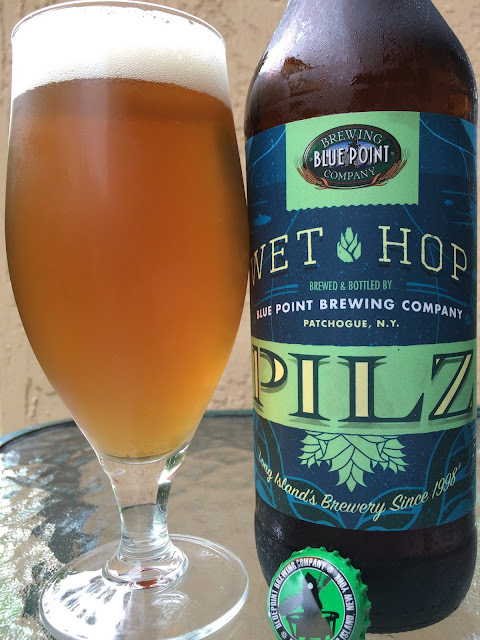 Wet Hop Pilz is brewed with fresh Saaz hops harvested from Elk Mountain Farm in Idaho. 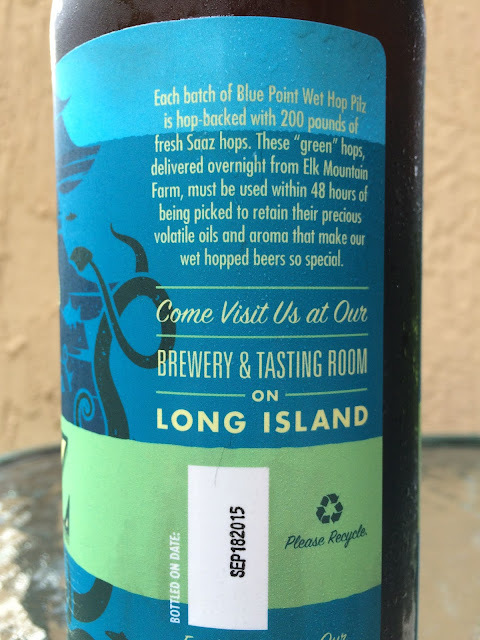 The hops are picked and rushed to the brewery in Long Island for use within 48 hours, thus getting the "wet hop" name. 5.9% alcohol. 20 IBU. Bottled on SEP182015. Nice sweet grain and honey aroma with a fresh, hoppy, floral counter. Very fresh and floral, hoppy flavors to start as well. Pleasantly bitter with sharp hoppy and spicy nips. A sweet honey flavor balances out a very enjoyable beer. Crisp, refreshing. Check it out.